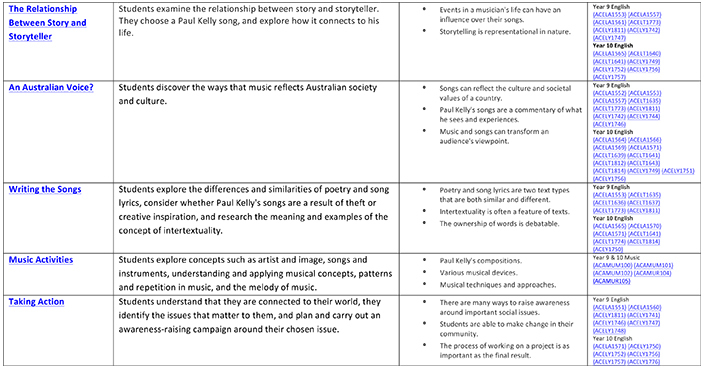 This resource has been written to address the content descriptors of the Australian Curriculum: English and Music. Learning activities in this resource are suitable for use across years 9 & 10, and have also been mapped to Units 1 & 2 of the Senior English curriculum. The lessons incorporate the film Paul Kelly – Stories of Me, as well as a number of other real-world articles and pictures as learning stimulus. The learning activities encourage student participation through movement, group and pair work, visible thinking tools and use of ICT for investigation and demonstration of thinking and learning all through which students are supported to create artefacts for the purpose of formative and summative assessment. Students are required to engage in meaningful reflection at the conclusion of each lesson, and are encouraged to continue their thinking and scrutiny around the topics addressed throughout the lessons. Each of the lessons feature a suggestion for the extension of student learning as well as ideas for providing learning support. The investigation and learning completed throughout the unit is applied to student’s local context through a scaffolded student-led social action project, wherein students choose an issue to raise awareness around: how they will take action and the manner in which they will present their learning for exhibition to a real audience. This unit address the content descriptors of the Australian Curriculum: English and Music. Learning activities in this resource are suitable for use across Years 9 & 10, and have also been mapped to Units 1 & 2 of the Senior English curriculum. The resource is made up of a series of sequenced activities that incorporate clips from the Paul Kelly – Stories of Me documentary. The lessons can be taught as an entire sequential unit of study, or as individual lessons. Paul Kelly – Stories of Me charts the many lives, loves and losses of Paul Kelly, one of Australia’s most gifted singer-songwriters. His songs have been marking out the Australian landscape and its people through words and music for almost 40 years. The stories and the music of Paul Kelly explore and reflect the Australian experience, life and culture. The film is a contemporary music documentary that allows students to explore popular culture, storytelling and how people are represented in texts. It highlights different aspects of the Australian experience and showcases how art reflects and celebrates life. The film’s portrayal of Kelly’s life and music covers themes such as relationships, family, culture, love, identity, death and friendship. Although a very private person in a public career, Paul Kelly – Stories of Me digs deeply into what makes Paul Kelly tick, revealing more about the man and his music than ever before. Computers/tablets to access the online worksheet. Device capable of presenting websites/videos to the class. Access to Paul Kelly – Stories of Me. Speaking with students, staff, family members and the local community prior to screening the film in order to pre-empt any possible responses. Encourage students to respond to and challenge ideas rather than people. 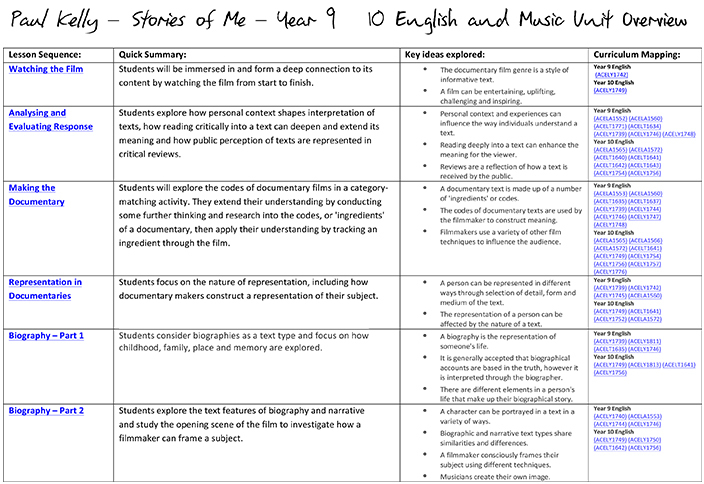 Download the Paul Kelly - Stories of Me Unit Overview here.